Daughter of a Danish merchant and a French mother. She worked as a telephone operator and as a model before she got her first stage engagement when she was twenty years old. In 1964 she had a daughter, the actress Anouschka Renzi by a civil servant who was born in Bolivia. Anouschka never knew her father. In 1965 she was Edith in "Geisterkomödie" by Noel Coward at the Theater am Kurfürstendamm and she played the main part in the movie "Playgirl" (1966). This movie made her instantly famous. In 1967 she married the actor Paul Hubschmid, who was 27 years her senior. They acted together in "Funeral in Berlin" (1966) and "Negresco - Eine tödliche Affäre" (1971). Anouschka was formally adopted by Hubschmidt. In 1971 she was added to the cast of the US television series "Primus". She made headlines when she called Bundepsräsident Karl Carstens 'an old nazi' during the Festspiele in Bad Hersfeld. She was fired but later a court proclaimed this unlawful because it wasn't proven that she had said it. She took her daughter to India to study with the Bhagwan sect, but in 1978 she complained of bad experiences. In 1980 she divorced Hubschmidt. During the eighties she was a succesful television actress in Germany. She died of cancer in 2005. 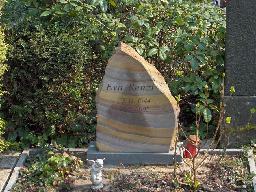 The grave of Eva Renzi at the Evangelischer Luisenfriedhof III, Berlin.